Students aspiring to major in biochemistry at St. Cloud State pair courses with engaging laboratory curriculum in chemistry, molecular biology, genetics and biophysics to prepare for advanced study or careers of distinction in medicine, health, biotechnology, material science and agriculture. You will use modern analytical instruments and microscopes, research tools and facilities for scientific analysis. You will learn the latest techniques for biomedical research from faculty members established internationally in their field. You will gain practical experience by using the tools and techniques in year-long collaborative research in fields such as diabetes, cancer, epilepsy, biofuels and medical devices. Hands-on experience through student–faculty collaborative research in analytical, physical, organic, inorganic, biochemistry, materials science and other interdisciplinary fields. Modern analytical and surface characterization instruments and microscopes, biochemical and molecular biological research tools and computerized molecular visualization facilities for scientific analysis. Faculty members with diverse cultural background and experience. Senior-year capstone experience involving student-faculty collaborative research and a senior thesis with oral and written presentations. Student research colloquium showcases student work and achievement. Professional development opportunities such as competitive student research awards and presentations at regional and national symposiums and conferences. 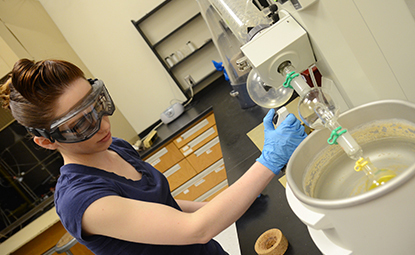 Active Chemistry Club offers social and professional networking and community outreach. Faculty members who work internationally, in countries such as Nepal, Qatar and India, bring global perspective to the study of chemistry.